BC | Cal Fasteners, Inc.
­­­­­­­­­­­­­­­­­­Cal Fasteners supplies the "BC" type connector by CMC Mfg. It is engineered with the 'PosiGrip' design and is made out of copper. The single hole solderless connector has unique ridges under the bottom of the contact surface to provide contact points for an electrically secure joint of the lowest resistance. The set screws for the 'BC' come in a slotted or hex drive so they can be easily installed with a hex wrench or slotted screwdriver. The set screws extend beyond the barrel sides to clamp down on the conductors. 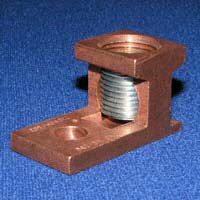 This type of design spreads the conductor strands to help dissipate heat and also improve its pull-out safety features and capabilities. The "BC" design of the wire way gives optimum transfer of the current, which creates a straight line flow through the connector for the least possible path of electrical resistance. There is also a positive wire stop provided on these Copper BC connectors. These 'BC' Copper Connectors are for use with Copper Conductors ONLY!! For more information on BC type connectors, contact Cal Fasteners or contact us to Request a quote.